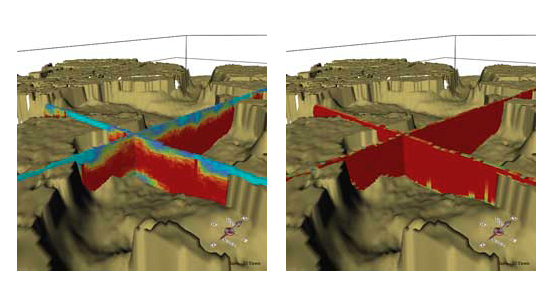 The Geological Survey of the Netherlands aims at building a 3D geological model of the upper 30 m of the subsurface of the Netherlands in order to provide a sound basis for subsurface related questions on groundwater extraction and infrastructural issues. The Province of Zeeland (SW Netherlands, covering an area of approximately 70*75 km) was chosen as the starting point for this model due to its excellent dataset of 23,000 stratigraphically interpreted wells. This project is part of the GeoTOP model which is a detailed three-dimensional model of the upper 30 to 50 meters of the subsurface of the Netherlands. The biggest challenge for TNO was to make an automated workflow to minimize the effort it takes to re-run a model. Isatis has a solid geostatistics core, without becoming a black box. Drs. Denise Maljers from TNO said. (1) 2D bounding surfaces were constructed using SGS in Isatis that allowed placing each 3D grid cell (100*100*0.5 m) within a correct lithostratigraphical context at formation and member level. (2) The lithological data from each well was transferred into a lithofacies code using newly developed, Python-based software. Examples of lithofacies zones include tidal channels, tidal flats and coastal dune sands. (3) The combination of the lithostratigraphical model and the lithofacies zonations (wat is dit? ), allowed us to perform a final SIS procedure in Isatis in which a 3D, 50 million cell lithofacies model was constructed. 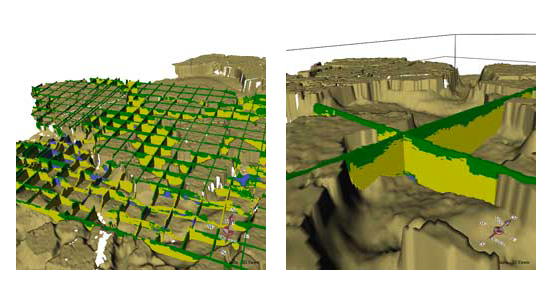 The procedure described above resulted in a 3D regional-scale facies model of Tertiary, Quaternary and Holocene strata. As an example, the 2D surface in Figure 1 represents the base of the Holocene Walcheren Member. Cross-sections (spacing between slices is 2 km) superimposed on the surface reveal the 3D facies distribution within this Member. Facies include tidal flats (green), tidal channels (yellow) and shell crags (blue). A detail of Figure 1 is shown in Figure 2a. The use of stochastic techniques (SGS and SIS) allowed us to compute probabilities for both lithofacies and stratigraphy for each grid cell, providing a measure of model uncertainty. Figure 2b shows the probability that a cell belongs to the tidal channel facies. Red indicates a high probability, lighter tones indicate a low probability. Analogously, the probability that a cell is part of the Walcheren Member is shown in Figure 2c. The Zeeland model provides important new insights on spatial connectivity of sediment units like for example Early Pleistocene floodplain clay layers and patterns of sandy Holocene tidal channel systems. “Our results represent a major step forward towards a cell based, 3D model of the Netherlands that should eventually replace the existing 2D models”, Denise adds. Outcomes of TNO modelling are 3D geological framework models and 3D volume models of which secondary products for applications can be extracted. The models are generic or multi-purpose models. Models as well as their secondary products are made available in 2010 through TNO website www.dinoloket.nl.